Reconstructing the emergence and evolution of life on our planet is tightly linked to the questions as to when and to what extent Earth’s atmosphere became oxygenated. New geological studies based on data from Western Greenland indicate that small levels of atmospheric oxygen developed already 3.8 billion years ago, some 0.7-0.8 billion years earlier than previously thought. Professor Robert Frei preparing for isotope analyses in the laboratory at the Department of Geosciences and Natural Resource Management, University of Copenhagen. Photo: Kent Pørksen. Today, most researchers agree that the oxygenation of Earth’s atmosphere happened in two major steps: the first during the so-called Great Oxidation Event about 2.5-2.4 billion years ago, and the second during the Late Neoproterozoic Era around 750 to 540 million years ago. The latter is thought to have been the cause for the emergence of animals during the so-called ‘Cambrian explosion’ around 540 to 520 million years ago. An international team of researchers led by Professor Robert Frei from the Department of Geoscience and Nature Resource Management at the University of Copenhagen has just released a study indicating evidence for the presence of small concentrations of oxygen on Earth already 3.8 billion years ago. The researchers analysed Earth’s oldest Banded Iron Formations (BIFs) from Western Greenland. 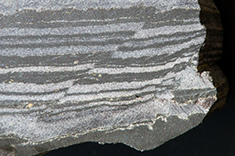 BIFs are marine chemical sediments originally comprised of alternating layers of silica and Fe-hydroxides and are widely used as geochemical archives. The reason for this is that they retain information on the composition and presence of oxygenation/reduction processes in ambient seawater and on the interaction of the atmosphere with Earth’s surface. The research team used concentrations and isotope compositions, i.e. variations of the same elements with different atomic weight, of the elements chromium (Cr) and uranium (U) present in the BIFs. Chromium and uranium were used as these elements weather rapidly when continental landmasses are exposed to reactive oxygen species (ROS) such as oxygen (O2). After weathering, they are transported to the oceans by rivers, where they are deposited with chemical sediments and serve as geochemical signals of weathering by ROS. One of the studied Banded Iron Formation (BIFs) samples from Isua, Western Greenland, showing the layers of deposited marine sediments. You can read more about this important scientific discovery in the article just published in Nature’s Scientific Reports Oxidative elemental cycling under the low O2 Eoarchean atmosphere by Robert Frei, Sean A. Crowe, Michael Bau, Ali Polat, David A. Fowle, and Lasse N. Døssing.